Brilliant design and meticulous maintenance give Pitmedden Garden its unique charm. With almost 6 miles of clipped box hedging, the parterres at the heart of the garden are a masterpiece of intricate patterns and sparkling colours. 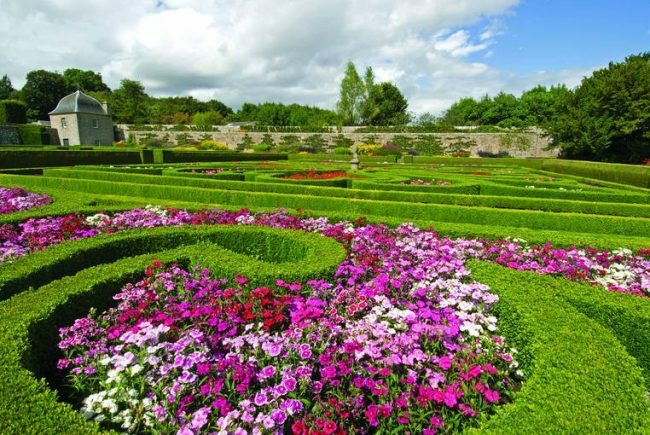 The Great Garden dates back to 1675 when it was originally laid out by Sir Alexander Seton. In the 1950s the Trust re-created the garden based on 17th-century plans of the gardens at the Palace of Holyroodhouse in Edinburgh. An orchard planted in 2014 is packed with more than 200 fruit trees. With honeysuckle and jasmine also casting their scent in the garden, Pitmedden really is a delight for the senses.